One of the best bits of my job is arranging for bands to play at L’Aubergade. From discussions with our friend, Vaz, in London who sources bands for us to greeting the guys off the plane and watching their reactions to the realisation they are playing not in a dark,dingy London club but surrounded by beautiful hills and clear air. 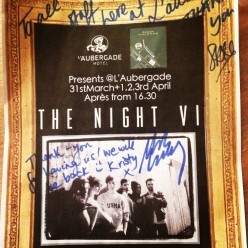 Last week we were so lucky to have three members of London based band The Night VI visit and play for us. 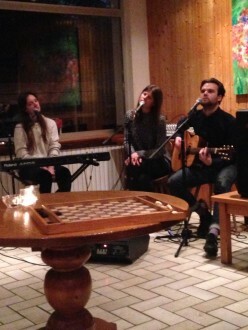 Fresh from the release of their new single ‘Sienna’ lead singer Sophie Rose, keyboard player Kristy and guitarist Jack took some time out from their busy gig schedule to squeeze in some skiing and played 4 sets for us at the hotel. 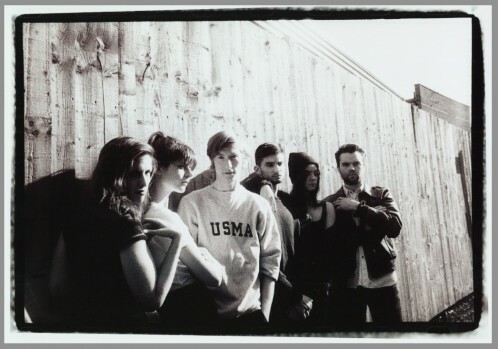 “An Anglo-French six-piece whose male/female dynamic is at the heart of their emotional, seductive music, The Night VI formed three years ago at the French Lycée in London. 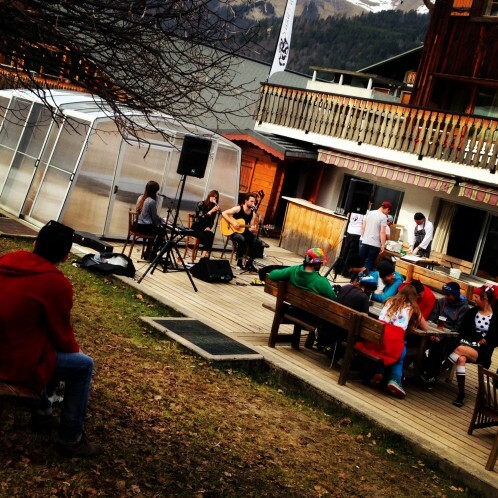 The Night III performed on our terrace playing out towards the mountain, complimenting the beautiful spring afternoons and bringing a little summer vibe. The guys took the opportunity to hone their acoustic skills and played some beautiful versions of their catalogue as well as a couple of some cheeky covers to get the audience going and in some cases singing along. Safe to say that those who came along to see The Night VI fell in love with their music and we at the hotel fell in love with the guys who were a pleasure to look after. We know the three fell in love with Morzine and maybe a little infatuated with skiing-just enough to bring them back if we’re lucky. Previous: Surfdome and Mountain Mavericks Competition Winner Announced! Next: Summer pricing at Hotel L’aubergade!